Few royal worcester artists are better known than Charles Baldwyn,(Charley). 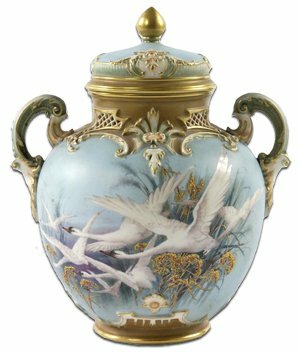 His paintings of swans in flight on royal worcester vases are instantly recognisable as his signature pieces. Charles Baldwyn was born in 1859, the son of worcester piano tuner and skilled musician Henry Baldwyn. Charles Baldwyn started work at the worcester factory at the age of fifteen and as with all young artists he spent his first year doing menial tasks around the factory. Highly sociable, he became great friends with William Hawkins and other members of the painters department. He was an active member of the works cycling club and took part in their social rides and races. His great love was the local bird life. He would spend hours in the countryside with other members of the painters shop sketching birds in the wild and would buy or borrow captured birds to study. His social circle included the likes of Richard Sebright, William Hawkins, Johnson, Rickets and Greatbach, a real who’s who of Victorian ceramic artists. 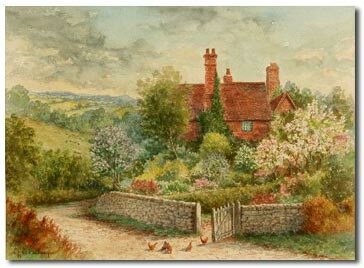 Charles Baldwyn also became very popular among Royal Worcesters well to do customers and his renditions of small birds and landscapes were much sought after. Charley quickly developed his own speciality, notably paintings of flying swans and birds in moonlit scenes. They became his trademark or signature pieces and during his employment with the Worcester factory, no other decorator was allowed to paint them. Prior to 1900 decorators were forbidden to sign their work but baldwyns special talent was obvious and Charley was allowed to sign his work from a much earlier date and common signatures are ‘C Baldwyn’ or just ‘BY’. Popular as Charles Baldwyn and other Worcester painters were, the 1880s and 90s were a hard time. Peoples thoughts where elsewhere, Britain was defending its empire oveseas and money was in short supply. Quality sales were getting harder and harder to come by. During these difficult years Charles Henry Clifford Baldwyn and other artists would supplement their income by doing private work. There are records, as early as 1885, of Charles Baldwyn buying part tea services (in the white) from the Worcester factory and decorating them at home for private sale. This was often done in the company of Thomas Bott junior (the famous limoges enamels artist) and with other artists from the factory. These privately decorated pieces were signed in order to make the most of his spreading reputation but would not carry the Royal Worcester factory mark or dating code. Charles Baldwin also did other work in the form of Watercolours on canvas and card. He would sell these where he could but he also submitted work to the great exhibitions and several of his paintings were shown at the Royal Academy. These were mostly of birds but with great emphasis on natural settings. His first and most notable exhibit in 1886, was of a group of birds set in a patch of teasels. This was his first ever submission to the Royal Academy and its acceptance for exhibition was a rare achievement. He eventually went on to have several other paintings exhibited. Charles Baldwyn married a local girl, Emily Hughes, on the 15th March 1897. His best man at the wedding was fellow Worcester painter William Hawkins. His first daughter, Stella, died of Meningitis in 1900 at the age of 23 months and another child, Bernard, died at the age of 12 months in 1907. In 1904, as hard times continued at the Worcester factory Charley finally left to work as a freelance watercolourist. He employed an agent called Mr Weave, to sell his paintings for him. 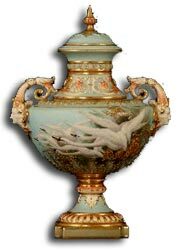 As with any great artists work, Charles Baldwyn’s pictures of flying swans were often imitated and Worcester porcelain designs and finishes, especially, were widely copied throughout Europe and even in the USA and Japan. The quality of the imitations are not as good, but to a casual glance or an inexperienced eye they did look very similar. Eventually, the Worcester factory became so worried about imitations that they registered the Charles Baldwyn designs. Collectors should be aware that Worcester made outline prints of the flying swans after Charley left the factory, and that these were coloured by other unnamed artists. This should be evident on close scrutiny, and they should not bear the Charles Baldwyn signature.